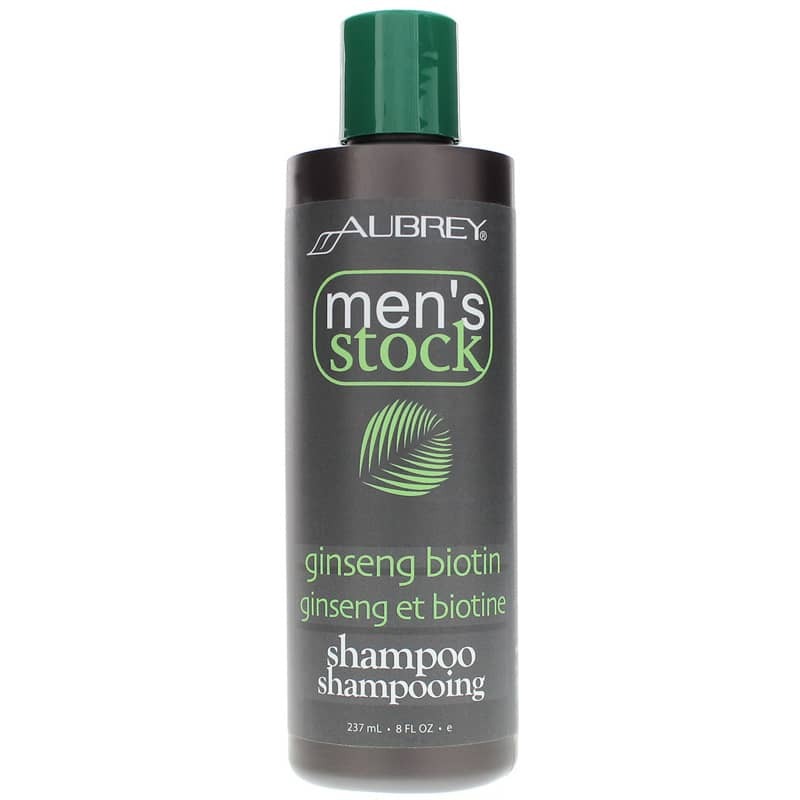 Mens Stock Ginseng Biotin Shampoo from Aubrey is a great choice for restoring body and fullness to thinning, fine hair and toning and energizing the scalp. 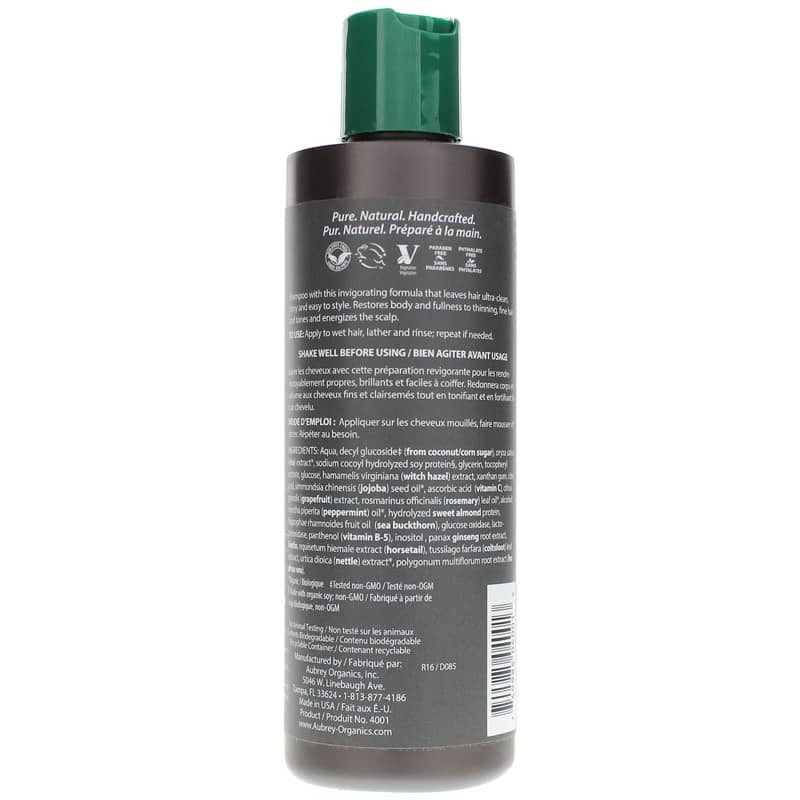 Shampoo with this invigorating formula that will leave your hair ultra-clean, shiny and easy to style. Biotin - Adds body and fullness. Amino Acids - Strengthen and revitalize hair. He Shou Wu - Energizes scalp. No paraben preservatives. No petrochemicals. No artificial colors or fragrances. Aubrey Organics uses only the finest herbal, plant extracts and natural vitamins in all of their products. Aqua, decyl glucoside (from coconut/corn sugar), oryza sativa rice extract*, sodium cocoyl hydrolyzed soy protein, glycerin, tocopheryl acetate (vitamin E), hamamelis virginiana (witch hazel) extract, xanthan gum, citric acid, simmondsia chinensis (jojoba) seed oil*, ascorbic acid (vitamin C), citrus grandis (grapefruit) extract, rosmarinus officinalis (rosemary) leaf oil*, alcohol, metha piperita (peppermint) oil*, hydrolyzed sweet almond protein, hippophae rhamnoides fruit oil (sea buckthorn), glucose oxidase, lactoperidiase, panthenol (vitamin B-5), inositol, panax ginseng root extract, biotin, equisetum hiemale extract (horsetail), tussilago farfara (coltsfoot) leaf extract, urtica dioica (nettle) extract*, polygonum multiflorum root extract, he shou wu extract.